Civility Experts South Africa is a licensed affiliate of Civility Experts Worldwide www.civilityexperts.com. 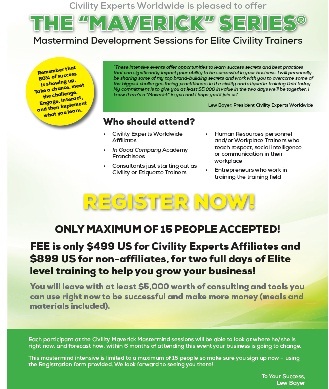 Civility Experts is recognized as the leading expert on civility in the workplace all around the world. The company owns more than 150 civility and etiquette products, 7 different certification programs, each is validated by the International Civility Trainers' Consortium. Are you a teacher or trainer looking for etiquette and civility training materials, visit the CIVILITY STORE to explore the wide variety of training material that we offer. Are you a consultant, teacher, trainer, or entrepreneur who wants to teach civility- Contact us directly to have a personal conversation to assess your business needs. ​Distance trainer programs available - please contact us for outlines and schedules. Already an etiquette or civility trainer- please consider attending the MAVERICK MASTERCLASS - Download Maverick Series details here.